You've got to hand it to bands that are committed to keeping the cassette tape alive. Cassettes might not have the warmth of vinyl or the clarity of CDs, but they have a certain charm all their own. Chicago's own scrappy, fuzzed-out rockers Geronimo! certainly think so and are doing their part to help you add to your tape collection. 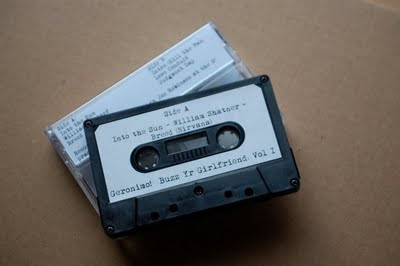 Tonight, August 17th, the band will release a limited run of cassettes at their Subterranean show, which also includes NYC's Grandfather and fellow Chicagoans Predators on the bill. 8 p.m., $8, 21 and over. Tickets here. The cassette--the first in a regular series Geronimo! plan to release dubbed Buzz Yr Girlfriend--includes six tracks and will be available for free at the show. You won't be able to get it anywhere else, so be sure to head out and get your copy! For more info on the project, check out Geronimo! member Ben Grigg discussing it on AV Club. You can also see the band's video "Design Yourself a Heart" below.